A while ago I was visiting my good friend in Seattle. When dinner came around, the husbands were sent out for some good ol' southern barbeque and when they returned, they forgot the side of mac and cheese. Tragedy! Oh no! However, my friend calmed down the growing panic by whipping up a gooey and perfect mac and cheese. It was a good reminder at how comforting and easy making macaroni and cheese from scratch can be. This recipe isn't that mac and cheese, but it's no less wonderful. What I like about this macand cheese is that it's chock full of vegetables, which is always a good thing in my book. 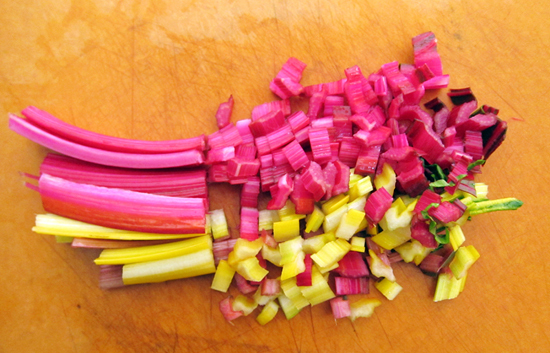 I used rainbow chard here look how gorgeous and full of colour it is! Is there any other vegetable that lovely? Another good thing about this dish is you don't need to toss out the chard stems. They get chopped to bits and sauteed along with the leaves. No waste! One of the little tricks that I like with this dish is that the cauliflower gets cooked with the pasta in a milky broth. Not only does this save on the dishes, but it makes sure you don't lose any nutrients down the drain. The milky broth along with the pasta and cauliflower get turned into a silky creamy sauce with the addition of a little flour. And of course, there's cheese involved. I like a nice strong Cheddar. Use as much or as little as you like. This recipe is written out a little differently than most I write. I wanted to show the order in how I did things. But like all recipes, please read through it all before you begin. And happy mac-making! Dice stems and onion and saute in olive oil for 5 minutes, stirring occaassionally over med heat. 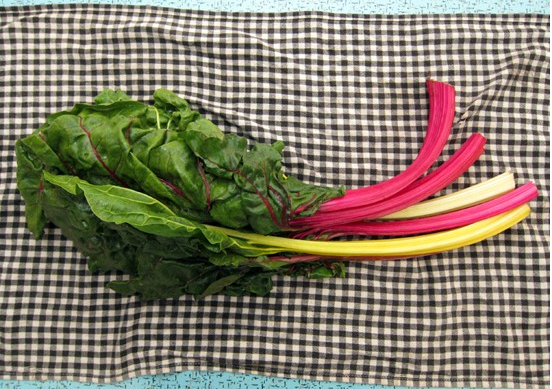 Add in sliced chard greens and let wilt. Stir in salt and aleppo pepper. Turn off heat and set aside. Cook macaroni in stock or water in a medium-large sized pot. When pasta is half-way cooked (about 5 minutes after adding into boiling water), top with 1/2 cauliflower and stir. Cover and let simmer over med heat for 5 minutes. 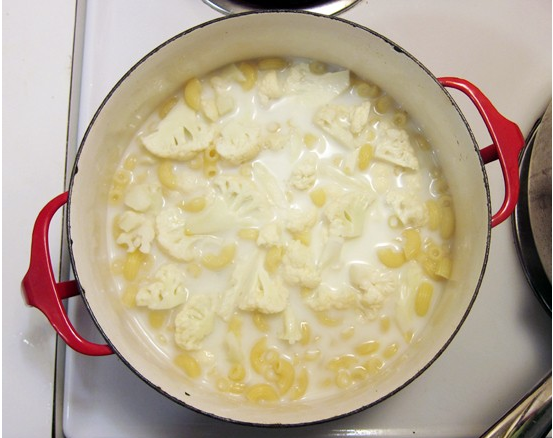 Pour in milk and let simmer over low heat until pasta and cauliflower is tender. Turn heat back on the skillet of greens and toss until hot. Sprinkle with flour and stir well. Pour milky mac and cauliflower into pan and stir well until thickened. If too thick, add in additional milk. Stir in nutmeg and mustard. Add in cheese and lemon zest and stir. Taste and adjust seasoning - add a bit more pepper or salt, if needed. Dump mixture into a casserole dish. 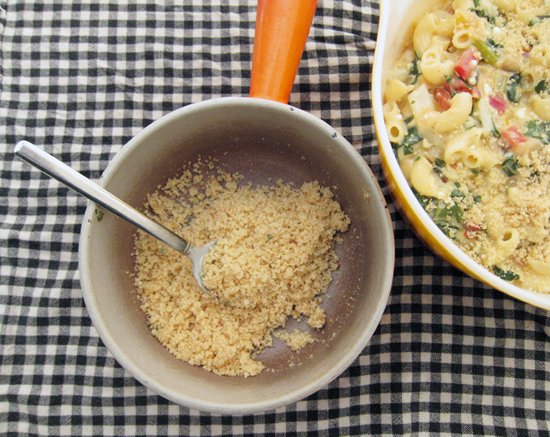 In a small bowl combine the breadcrumbs with the oil and herbs. Scatter over mac and cheese. Pop the whole shebang into a hot oven and bake uncovered for 30 minutes. Serves 4-6. This looks incredible. Mac and Cheese from scratch is one of my ultimate comfort foods, but I always feel kind of guilty about the carb fest. This could be the perfect way to get my comfort fix AND keep feeding myself vegetables :) Thanks for sharing! 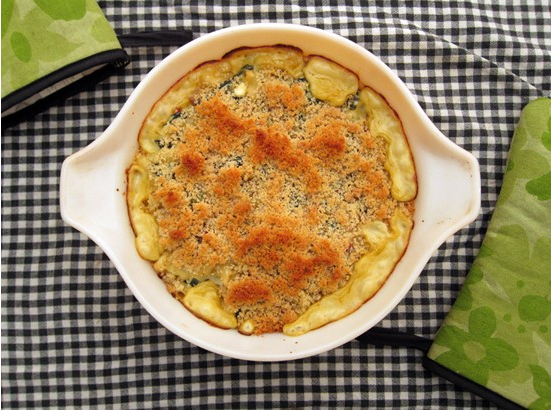 My favorite comfort food meets some of my most favorite veggies! This is a must try! Thanks for sharing Jeannette. This sounds delicious, and I love the sneaky vegetable additions! WOW! This looks delicious..def going to have to try it. this was dinner tonight at our house and i can't believe how delicious it was! when i was preparing it i thought it didn't seem like very much macaroni, but i was wrong! i will definitely be making this again. Cauliflower gratin is one of my fave dishes and your creation just looks like a beautiful marriage of mac 'n cheese and cauliflower gratin. Yum!!! Is it really just 1/3 c pasta boiled in 1 c water? Even after adding the 1/2 c milk it didn't seem like enough liquid.